What can you use as light source during a blackout? Candles help when everything is settled but what about when it first hits? Do you use the torch function on your mobile device? Or do you reach for a flashlight? While there are many options for those who use the latter, nothing quite beats a hand-cranked version. Not having to rely on an outlet for power is great in emergency situations like blackouts or when you’re camping and won’t have access to modern amenities for days. But what features should the best hand crank flashlight have? BE PREPARED FOR ANYTHING, ANYWHERE, ANYTIME: This emergency self powered LED flashlight is a must for every household. Its many functions could mean the difference between life and death in case of a major catastrophe, like an earthquake or a tornado. 3-IN-1 VERSATILITY: This multifunctional survival tool features a bright LED flashlight and an AM/FM/NOAA Weather Radio. Its battery can also be used as a power bank to charge your cellphone. SELF POWERED & EASILY CHARGED: The battery can be charged via a microUSB cable linked to a computer or to a DC adapter. There's also the option to expose it to sunlight and charge it via the in-built solar cell, or to wind it up by hand - 1'of cranking supports up 30' of continuous light. LIGHTWEIGHT & COMPACT: The survival tool is only 5''x2.4''x1.6'' and weighs less than 0.5 lbs. It's practical & portable - the perfect item for any emergency situation. There are so many reasons to love the self-powered flashlight from Always Prepared. First off, you have three options of charging it: through solar, by hand-cranking it and through a USB. It’s also a 10,000-12,000 MCD LED flashlight which can light up a path 15-20 feet ahead of you making it not only great outdoors but for indoor use as well. 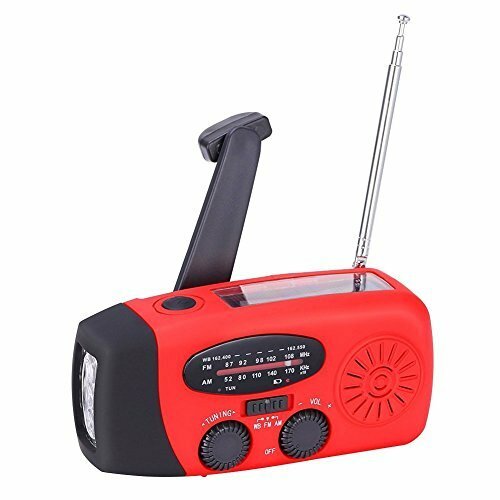 To top it all off, this flashlight also comes with an AM/FM radio which comes in helpful when you still want to listen to the news and music while outdoors or when the power is out. Comes with On/Off switch, Crank Lock toggle and a Carry Strap. 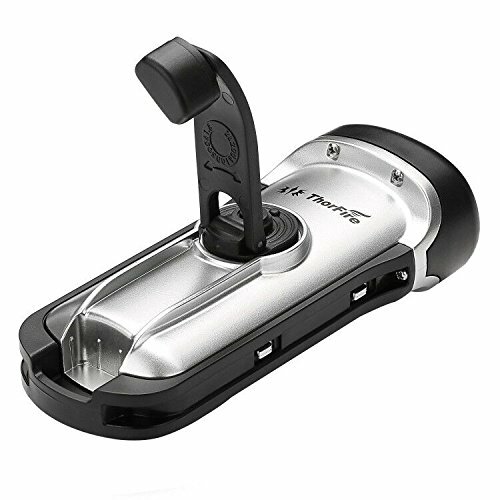 Weighing 10.4 ounces and measuring 4.8 x 4 x 2.5 inches, the Immedia-Light from Chromo Inc makes the it the best hand crank flashlight to take just about anywhere. It’s small enough to fit in your bag, in the trunk of your car or in a drawer at home. Plus, it only takes a few cranks to activate the three-LED light. This also comes in a pack of four so you can share among family members or store in different places. What this emergency light has going for it is efficiency: you only need about six minutes of hand cranking to get it to provide an hour’s worth of light. Apart from being self-powered, the flashlight also has a built-in rechargeable battery. 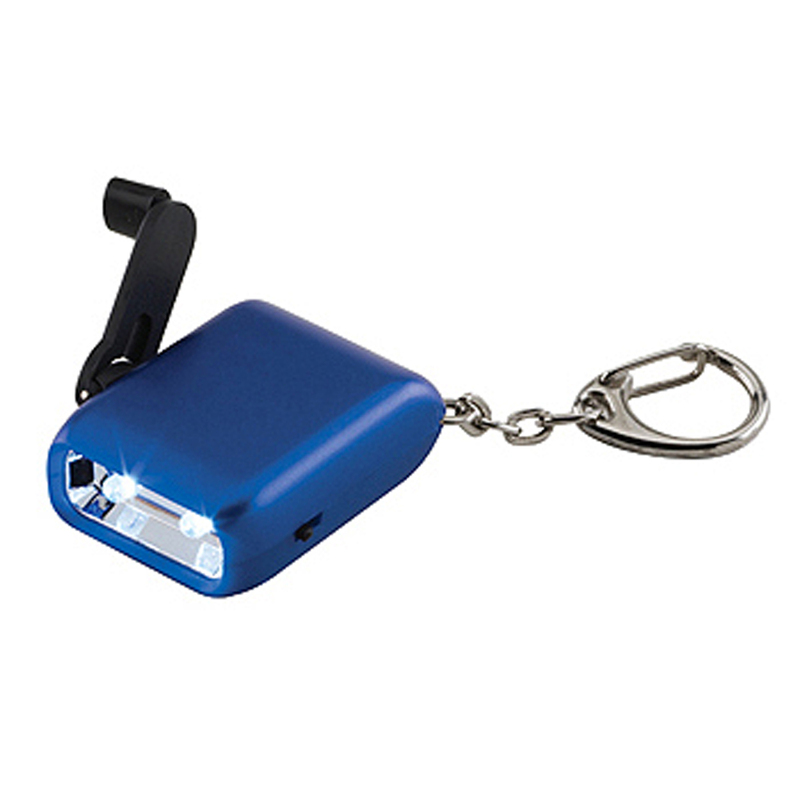 Fitted with a carabiner clip, this light source makes the perfect companion when exploring the outdoors in the dark or low-light situations. While you can certainly power up this device by using the hand crank, it also has a built-in solar panel that allows it to be recharged when the sun is out. This model is also protected against rain and is windproof as well making it a great companion for the outdoors given how sudden weather pattern changes. The Secur hand crank flashlight features three kinds of LED use: one, three of three LED’s flashing. ▶ Solar & Hand crank powered flashlights no batteries needed. This no battery flashlight is perfect for emergencies, power outages or anytime you need light. ▶ High Efficiency of Energy Conversion Cranking Flashlight: Just 1 minute cranking will generate enough power for 1 hour long using time. ▶ IPX6 Waterproof and Submersible up to 45 feet. Very durable and handy tool for home and outdoor use. Such as for Vehicle use, Camping, Hiking, Travel Etc. Whether you do survival adventure or rock climbing this no battery spotlight is a must have. ▶ Bright Flashlight:This solar powered torch light is equipped with high quality LED bulb. 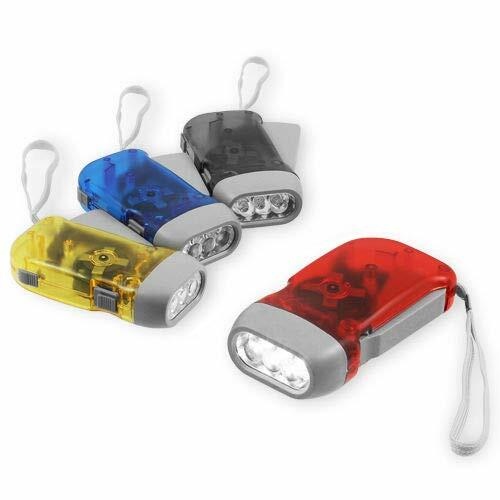 Very portable and bright flashlights. Put it in the sun or wind it up to recharge. ▶ Warranty: ThorFire will provide customers with 40 days money back guarantee and 18 months hassle-free warranty with considerate customer service. Order with no worries! 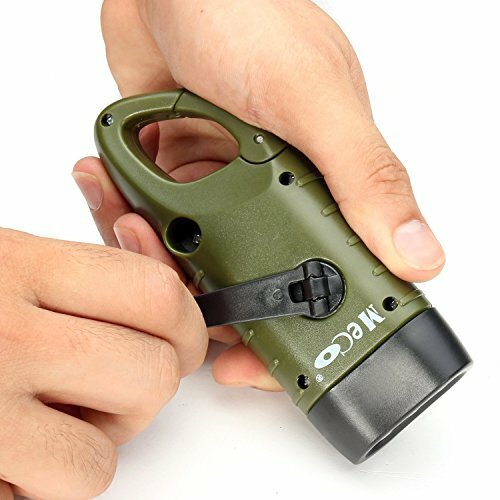 This compact hand crank flashlight is the perfect companion when an emergency situation hits. In just one minute, you can get 80 minutes of light with just one LED and 60 minutes of using all three LEDs. This model is also a good outdoor companion as it can use direct sunlight to charge itself.